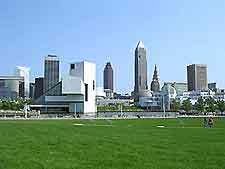 For many visitors to Cleveland, driving is the transport mode of choice and if you plan to travel beyond the city limits, you might want to follow their lead and hire a car, as public transport stops short. However, if traveling within Cleveland city from downtown to the University Circle, you might want to jump on The Rapid - Cleveland's light rail system. Alternatively, RTA buses travel around five downtown loop routes from Public Square. 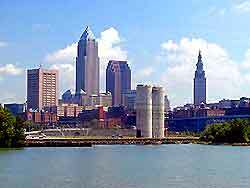 More than 350 flights arrive at Cleveland Hopkins International Airport each day and the airport is situated approximately 10 miles / 16 km south of downtown. The drive from the airport to downtown takes about 20 minutes by car and major car rental companies are housed at a central off-site lot accessible by shuttle bus from the airport. The RTA Red Line provides regular travel into the city from the airport, with the ride taking about 25 minutes to downtown Cleveland and about 40 minutes to the University Circle district. You can also catch cabs from outside baggage reclaim exit two. 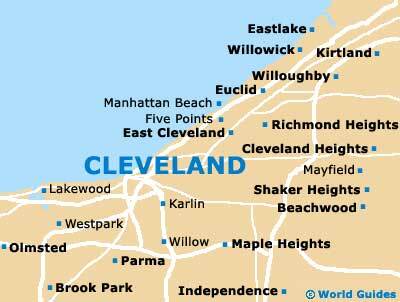 For further information, please refer to the Cleveland Airport travel page. A hire car is a convenient way to travel from the airport to the city, around town and to out of town attractions. Cleveland's public transport does not extend beyond the city, so a hire car is a necessity if you plan to travel farther afield and explore the surrounding areas. Major car rental companies in Cleveland are housed at a central off-site airport car park that's accessible by shuttle bus from the airport, while there are also car rental offices around town. Parking in Cleveland is rarely problematic as there are many car parks in the city. Car park rates vary according to their location and some of the out of town malls offer special rates for shoppers. The Greater Cleveland Rapid Transit Authority (RTA) runs more than 100 bus routes in the Greater Cleveland area. The system covers downtown and Cleveland's eastern, western and southern suburbs, while 'loop' buses travel around downtown, serving shoppers and commuters. The RTA rail transport system has three lines. The most popular line with visitors to Cleveland is the Red line, which provides travel between the airport and University Circle, stopping at Tower City Center and Ohio City. From Tower City, the Windermere line travels south of downtown Cleveland to University Circle and finishes at Windermere Station on Euclid Avenue, on the eastern side of the city. The Blue line goes from Tower City through Cleveland and out to Woodland Avenue, Van Aken Boulevard, Warrensville Center Road and Chagrin Boulevard, while the Green line goes from Tower City to Shaker Boulevard and Green Road. Hailing cabs from the street is not always easy in Cleveland and it is recommended that visitors call for a taxi and make an advance booking. Cycling through the city is a good way to explore and discover its hidden facets. The city of Cleveland maintains several bike trails to help you on your way.